Villa Cala Dia has distant views over the stylish marina of Cala D'or, which can be enjoyed from all 3 floors of the house. The waterfront is lined with a huge choice of chic restaurants, all within a few minutes' walk. The resort centre and nearest beach are also accessible either on foot or by car. This 4 bedroom villa has a spacious interior, a private swimming pool and a small lawned garden, plus includes air conditioning/heating in the bedrooms and lounge, as well as WiFi. The views towards Cala D'or Marina. If a central location or excellent view is on your agenda, this villa is the ideal choice! The private swimming pool has Roman steps for easy access, as well as a fenced shallower section at one end. The pool is surrounded by an L-shaped terrace and lawn where you can sunbathe and take in the view. The brick BBQ is to one side of the garden, and there is a table and chairs on the first floor terrace to enjoy alfresco dining, with views of the marina in the distance. From the parking area at the front of the house, 5 steps lead down to the entrance of Villa Cala Dia, which opens onto the middle floor. The combined lounge and dining area has 3 sets of patio doors opening onto a large dining terrace with views over the neighbouring marina. The living area is decorated with colourful paintings by a local Majorcan artist. The fully equipped kitchen and utility room are accessed from the dining area. A WC completes the living space. Stairs from the living area lead to a twin bedroom on the first floor. This bedroom has an en suite shower room and access to a balcony on both the front and rear of the house. Stairs down from the living area lead to the remaining bedrooms on the lower floor, which all have direct access to the pool terrace. The double bedroom has an en suite shower room whilst the 2 twin bedrooms share a separate bathroom. Please note: The only place where it is possible to fit child gates is at the very top level of the villa as you exit the en suite twin bedroom, or at the very bottom level where all the remaining bedrooms are located. The location of Villa Cala Dia could not be better! Positioned right by the fashionable Cala D'or Marina, you'll have a huge choice of stylish restaurants and bars right on your doorstep. Beach lovers will not be disappointed, with the picturesque sandy cove of Cala D'or only ¾ mile away. There are a number of alternative beautiful bays easily accessible by car further along the coast. For larger groups, Villa Cala Nit is next door. The beautiful marina of Cala D'or is only 2 minutes' away on foot. A pleasant walk around the marina, overlooking the moored up yachts, will bring you to a huge choice of chic restaurants and shops lining the waterfront on both sides. As you can imagine, fresh fish is a popular menu theme here - a great choice for seafood lovers! Or, venture into the centre of Cala D'or where you'll find a choice of pavement cafes, bistros and open air bars, as well as many souvenir shops, in the pedestrianised area. Cala D'or has 7 small but beautiful sandy coves along its coastline. 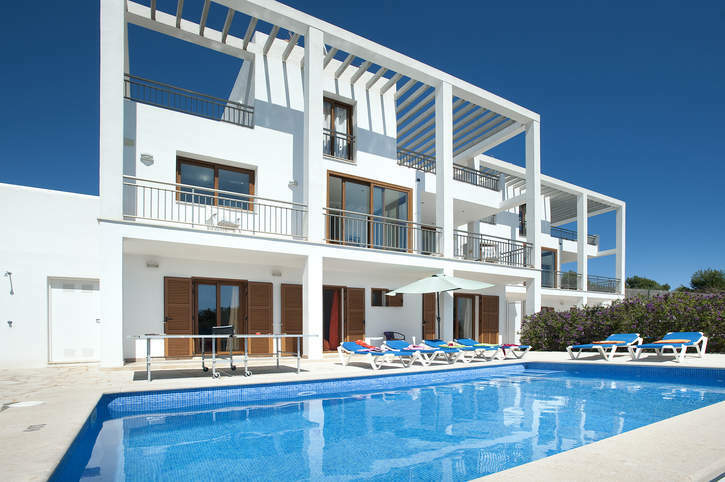 The nearest to Villa Cala Dia is that of Cala D'or itself, around ¾ mile away. The beach is walkable but easier to reach by car. Any of the other 6 bays can be reached easily within a short drive. Aqualand waterpark in El Arenal is around an hours' drive back towards Palma. Children will also love the safari zoo located in Cala Millor, around 40 minutes' drive further along the coast. Any of the small coves, restaurants and shopping areas within Cala D'or are well worth a visit. Further afield, Palma City is the ideal venue for a daytrip, to see more of what this beautiful island has to offer. The nearest golf course is the Golf Vall D'or, a little over 4 miles north. Sailing and diving facilities can be found nearby, and are both very popular activities with both locals and visitors to the area. Villa Cala Dia is not available to book for season as it is sold out. Take a look here at the Majorca villas that are currently on sale. Fantastic villa! Better in real life than in the photos, perfect position, everything only a short walk away.